A tragic in depth perzine that explores the relationship of the author and her brother during his drug use and incarceration. It shows the awful truth and consequences that drugs create and conveys what it was like to grow up in such an environment. In this text heavy issue, Sam talks about the amount of food that is lost each year in her garden to insects and animals. There are stories about an injured chicken, buying & raising turkeys, and the inevitable loss of a few turkeys. Being knowledgeable about food, food not bombs, and more! 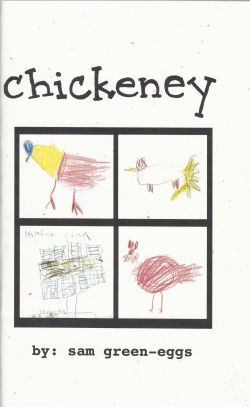 "i feel like this issue of chickeney is kind of a downer, but i'm just sharing the truths of my life on the farm. this year has been rough in a lot of ways and that's just the way it is." Sam starts this issue off with an updated list of characters, AKA the front yard flock, the garden flock, and the backyard flock. A story of sleepless nights because of killer raccoons, cute kid drawings, an informative piece about clopyralid (herbicide), a white hummingbird update, and the growth of sunberry plants fills the pages. "i live with my mom in the house i grew up in and the acre of land on which it sits. i find great comfort in my familiarity with our land and i enjoy seeing the changes as the seasons go by." 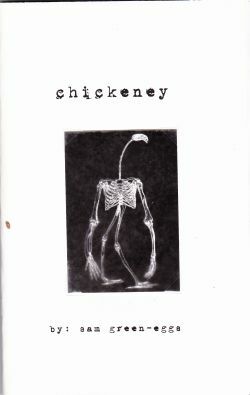 I was really excited to see an updated "cast of characters" in this new issue of Chickeney. It's a wonderful mix of humans, dogs, cats, turtles, frogs, turkeys, and their large flock. Sam writes about why she isn't a fan of spring, her adventure with radishes, and a weed barrier project gone wrong. I also enjoyed the rogue turkey story which included a great picture. 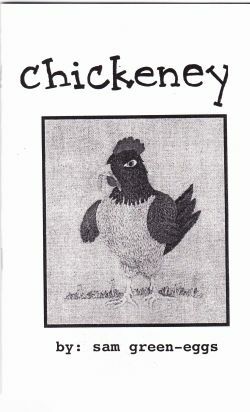 I can always count on Sam to write an informative and interesting zine about farming, cooking, and animals. Sam is a lover of plants and animals, a homemaker, farmer, and gardener. She seeks to find unique value in things that aren’t mass produced and wants to learn new skills, especially ones related to food. She tells tales from the acre of land she lives on with her family of dogs, cats, humans, turtles, frogs, vegetables and many flocks of birds. There are stories about coexisting with bumblebees, understanding the cruelness of nature, savoring squash and battling a gang of juvenile raccoons. This issue is text heavy and beautifully hand written. The first thing I wanna say about the context of this zine is that I'm jealous of the lavish attention the author pays our hero, chub-chubs. That aside, this tiny publication packs a powerpunch of awesomeness! The graphics are supercool, the storyline is full of warm fuzzies, and our hero aint no zero and continues to visit us daily with much daring duo! I give this micro an astounding 5 stars! After an eleven-year relationship ends, Jaime Raybin downloads a dating app. "Composite Internet Boyfriend," is an autobiographical narrative that includes writing and watercolor illustrations. The writing jumps between the real world and speculation about the person on the other end of the conversation. It explores the nature of loneliness and a longing for connection. It is like being able to see the future on a first date - to know that you had a good time, but that he won't call you again, even though he acts like he will.